Welcome (back) USF Student Volunteers! Once again, the Seminole Heights Community Garden will benefit from a USF Morning of Service event. We’re expecting up to ten student volunteers to visit us this Saturday morning, arriving at 9:15-9:30 am and leaving 12:15-12:30 pm. That’s three hours of people power, and we need to show our appreciation with lots of members on hand to greet and guide them. Can you help? Categories: Requests, Volunteers | Permalink. Thank you to all the members who helped us tie down the garden this week before the impending storm Irma. We will not be working in the garden Saturday 9/9/2017. Categories: Kudos, Volunteers | Permalink. A huge thank you to Madeline Baker for our new look and logo – we love it! This past Saturday we hosted a group of USF student volunteers participating in their annual Stampede of Service. The volunteers arrived bright and early, the weather cooperated, and we all got to work. We spent the morning pulling weeds all around the edges and down the rows, turned the compost and sifted dirt, watered the plants that needed it, and had many interesting conversations about growing organic food. Many of the students took home greens (kale, collards, mustard greens) as well as tomatoes and lemongrass which we were so happy to share. Thank you to the garden members who came out and provided guidance for the students, and Denise for bringing the refreshing lemon water! Thank you USF Student Volunteers! 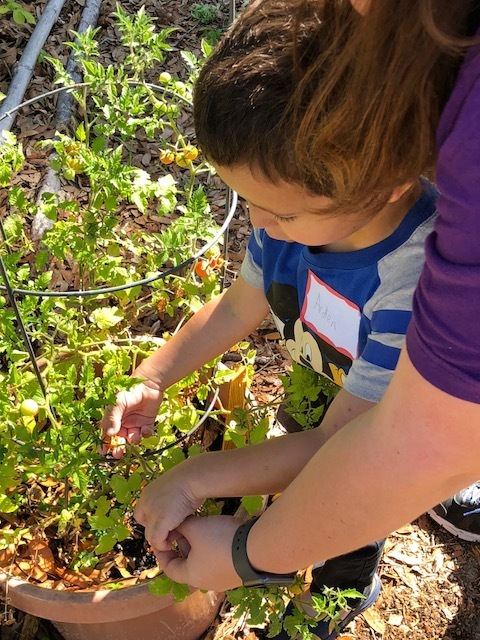 We had a fantastic day in the garden with the help of USF Student Volunteers during the annual city-wide service event called CHARGE. These students helped us weed and sift dirt and prep our garden for our upcoming fall planting. Thank you to all who came out today! Our off-the-grid irrigation is off the charts! Who needs city water to grow a garden? 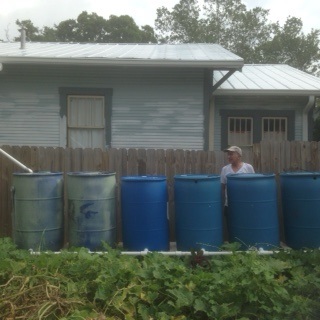 A couple of heavy rains this week is all it took to fill up our 550-gallon cistern and all seven of our 50-gallon rain barrels. The water is fed into the cistern from the metal roof of our next door neighbors Adam and Patti Ann Rugland (they’re new garden members, too… welcome! ), and can then overflow into the barrels through a connection of pipes that was designed and installed by Ricardo Bonilla (pictured here) with the help of Tim Baker and Tony Perilla. Our gratitude to this able team of “hydro-engineers”, and thank you once again to both the Tampa Garden Club and the Hillsborough County’s Neighborhood Relations office, whose funding grants have made it possible for us to develop this efficient, eco-friendly irrigation system for the garden.